The Pillars of Creation is one of the most memorable and iconic images taken by the NASA/ESA Hubble Telescope in 1995. Now, 20 years after the image was taken, the Hubble telescope returned to that location and took an even clearer and amazing image of the Pillars of Creation in HD. Watch accompanying video (Hubblecast 82) for more details. The Pillars of Creation is a part of Messier 16 or the Eagle Nebula. Nebulas are clouds of gas and dust in space where stars and planets start to form. It is believed that our own Sun was formed in a similar region resembling the Pillars. The new mage of the Pillars of Creation is so iconic that it is not unnatural to see the image in movies, t-shirts, stamps, and accessories. Its release marks the 25th year of the Hubble Telescope in orbit and was presented at the 225th meeting of the American Astronomical Society in Seattle, Washington, USA. The NASA/ESA Hubble Space Telescope has captured many breathtaking images of the Universe, but one snapshot stands out from the rest: the Eagle Nebula’s Pillars of Creation. In 1995 Hubble’s iconic image revealed never-before-seen details in the giant columns and now the telescope is kickstarting its 25th year in orbit with an even clearer, and more stunning, image of these beautiful structures. The three impressive towers of gas and dust captured in this image are part of the Eagle Nebula, otherwise known as Messier 16. Although such features are not uncommon in star-forming regions, the Messier 16 structures are by far the most photogenic and evocative ever captured. 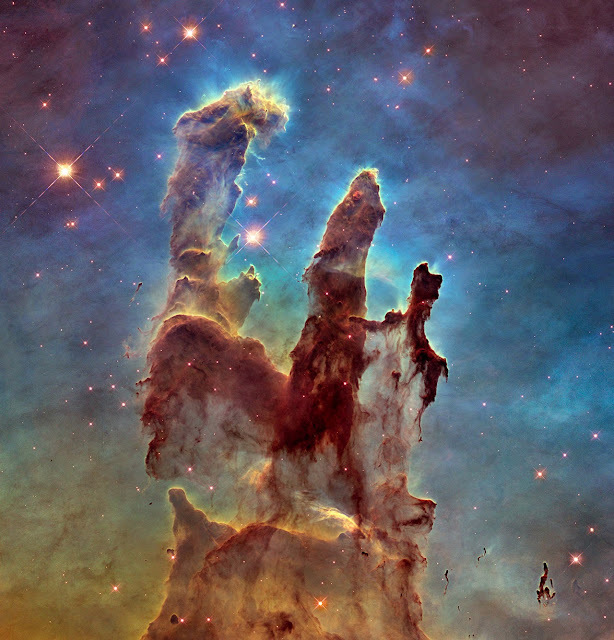 The Hubble image of the pillars taken in 1995 is so popular that it has appeared in film and television, on tee-shirts and pillows, and even on postage stamps. Now Hubble has revisited the famous pillars, capturing the multi-coloured glow of gas clouds, wispy tendrils of dark cosmic dust, and the rust-coloured elephants’ trunks with the newer Wide Field Camera 3, installed in 2009. The visible-light image builds on one of the most iconic astronomy images ever taken and provides astronomers with an even sharper and wider view. In addition to this new visible-light image, Hubble has also produced a bonus image. This image is taken in infrared light, which penetrates much of the obscuring dust and gas and unveils a more unfamiliar view of the pillars, transforming them into wispy silhouettes set against a background peppered with stars. Here newborn stars, hidden in the visible-light view, can be seen forming within the pillars themselves. Although the original image was dubbed the "Pillars of Creation", this new image hints that they are also pillars of destruction. The dust and gas in these pillars is seared by intense radiation from the young stars forming within them, and eroded by strong winds from massive nearby stars. The ghostly bluish haze around the dense edges of the pillars in the visible-light view is material that is being heated by bright young stars and evaporating away. With these new images come better contrast and clearer views of the region. Astronomers can use these new images to study how the physical structure of the pillars is changing over time. The infrared image shows that the reason the pillars exist is because the very ends of them are dense, and they shadow the gas below them, creating the long, pillar-like structures. The gas in between the pillars has long since been blown away by the winds from a nearby star cluster. At the top edge of the left-hand pillar, a gaseous fragment has been heated up and is flying away from the structure, highlighting the violent nature of star-forming regions. These massive stars may be slowly destroying the pillars but they are also the reason Hubble sees the structures at all. They radiate enough ultraviolet light to illuminate the area and make the clouds of oxygen, hydrogen and sulphur glow. Although structures like these exist throughout the Universe, the Pillars of Creation — at a distance of 6500 light-years away — provide the best, and most dramatic, example. Now, these images have allowed us to see them more clearly than ever, proving that at 25 years of age, Hubble is still going strong. This image and the associated results were presented today at the 225th meeting of the American Astronomical Society in Seattle, Washington, USA.